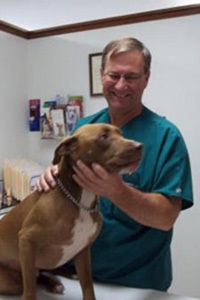 Dr. Kevin Kackley is the owner of the Mt Sterling and Rushville Veterinary Clinics P.C. The practice was established in 1984 and has steadily grown to a thriving 4 doctor practice. Dr. Kackley concentrates on bovine and small animal medicine and surgery along with practice management and overall direction. Dr. Kackley is a member of the Illinois Veterinary Medical Association and served on the board of the Illinois State Veterinary Medical Association for 8 years. Dr. Kackley has lived in Mt Sterling since graduating from the University of Missouri College of Veterinary Medicine in 1984. He has a son Michael and a daughter Melissa. Dr. Kackley is active in the Mt Sterling community. He served on the school board for 20 years, is a past member of the Brown County development Board, and he is also a member of the First Baptist Church.